Percentage of owners of gas-powered vehicles who say their next vehicle will also have a traditional internal combustion engine. Only 53% of owners of electric vehicles say they’d replace buy another EV. That measure falls further among owners of diesel vehicles (47%), hybrids (44%), and plug-in EVs (31%). The amount Canadian households can save in operating costs (maintenance and fuel) by driving battery electric vehicles, rather than gas-powered vehicles. Total consumer debt (including mortgages) among Canadians in Q2 of 2018. That’s up from $1.828 trillion in Q1. Percentage of Ontario drivers now use winter tires. That’s up dramatically from 59 per cent last year. Number of light vehicles sold in Canada in September, a 7.4% drop from September 2017. It was the sharpest year-on-year drop in monthly sales since 2009 after record-high sales figures in 2017. Percentage of the Canadian fleet that was scrapped in 2017 – a total of over 1.3 million vehicles. The Canadian scrappage rate is expected to come in around 4% in 2018. Projected U.S. scrappage rate for 2018. The rate, which has tracked around 4.25% for the last two years, appears much higher due to changes in the calculating method. 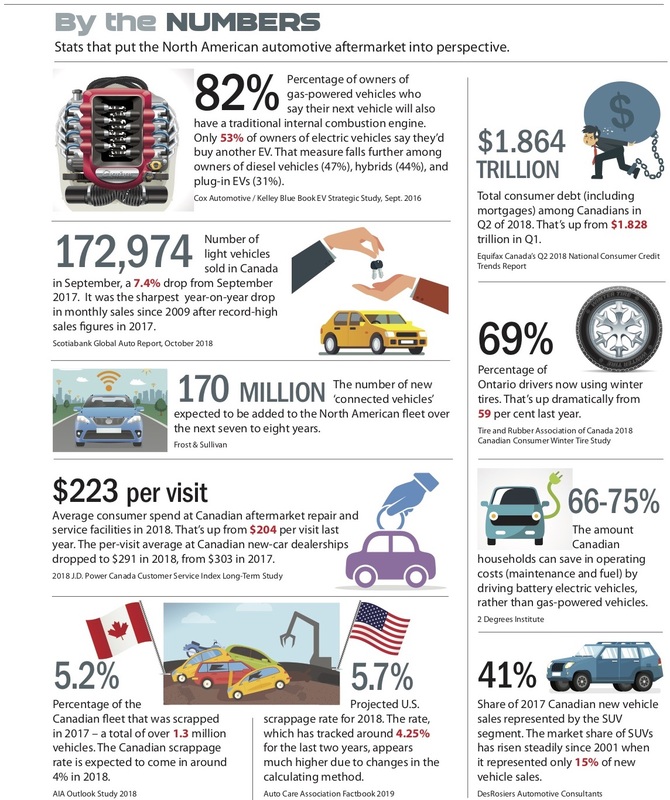 The number of new ‘connected vehicles’ expected to be added to the North American fleet over the next seven to eight years. Average consumer spend at Canadian aftermarket repair and service facilities in 2018. That’s up from $204 per visit last year. The per-visit average at Canadian new-car dealerships dropped to $291 in 2018, from $303 in 2017. Share of 2017 Canadian new vehicle sales represented by the SUV segment. The market share of SUVs has risen steadily since 2001 when it represented only 15% of new vehicle sales. Wakefield Canada appoints new territory sales manager in B.C.